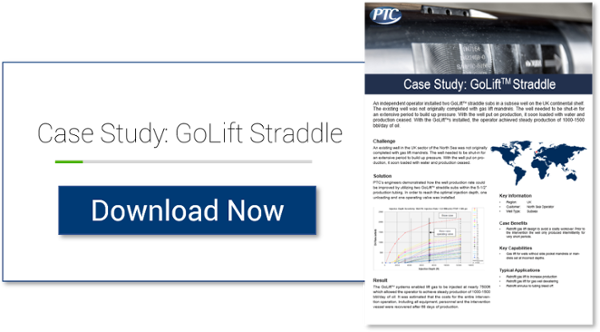 GoLift Straddle > PTC - Well head, Gaslift, and Chemical injection for improved well performance and integrity. Retrofit gas lift design to avoid a costly workover. Prior to the intervention the well only produced intermittently for very short periods. Gas lift for wells without side pocket mandrels or mandrels set at incorrect depths. An independent operator installed two GoLiftTM straddle subs in a subsea well on the UK continental shelf. The existing well was not originally completed with gas lift mandrels. The well needed to be shut-in for an extensive period to build up pressure. With the well put on production, it soon loaded with water and production ceased.